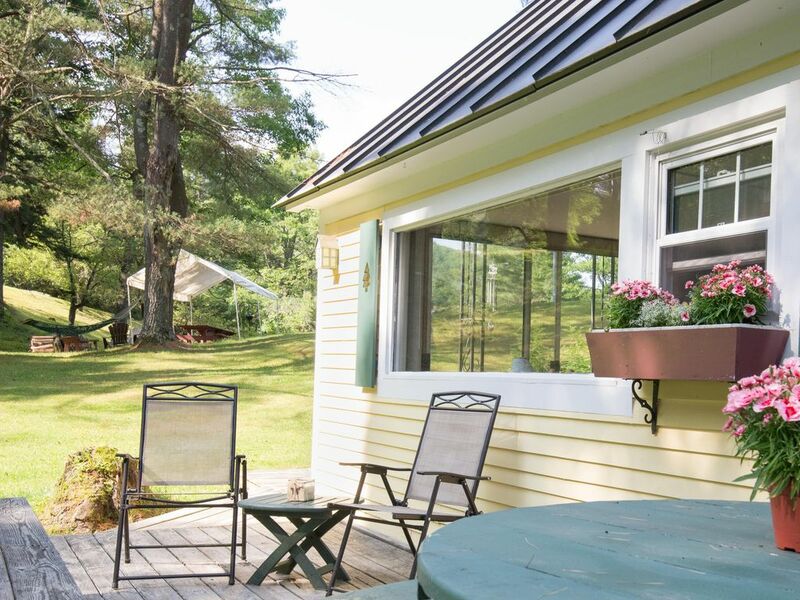 Sterling Cottage is a charming and cozy little house situated on seven acres of privately owned property by Jason and Elizabeth LeMoine. There are picturesque views from our hills, a wooded area, and a private pond. The cottage is located on Route 4, two miles east of the Village Green in Woodstock, VT. Just a short five-minute ride you will be in the Village of Woodstock where you will find restaurants, art galleries, historical museums, and shops. Hiking Mount Tom is just a short walk from the village. From the village Billings Farm & Museum and the Green Mountain Horse Association are just minutes away. If you are here for some great skiing, there is the Woodstock Ski Touring Center for cross-country skiers and for downhill there is our own local ski area Suicide Six. Killington Ski Area is just 30 minutes away from the cottage driveway. The Woodstock Health and Fitness Center is also open to the public. It includes an indoor pool, yearlong tennis and squash courts, and weight training equipment. The cottage is centrally located within 20 minutes of the Upper Valley shopping plazas and restaurants, 30 minutes to Dartmouth College in Hanover, NH. Amenities: Our lodging accommodations have one bedroom with a queen size bed and walk-in closet; there is a full bath, and laundry area. The living room, which has a full size sleeper sofa, shares space with the dining area and kitchen. The kitchen has a full size refrigerator, stove/oven and dishwasher. A Keurig Coffee Maker with coffee is provided in regular and decaf. The living room is very bright with an eight foot sliding glass door that opens up to the porch and grounds. There is a gas fireplace, and cable TV (HD Flat Screen) with AppleTV and Chromecast in the living room. There is also a TV (HD Flat screen) in the bedroom. We offer high speed wireless Internet access at no charge The cottage has central gas heating and is air conditioned in the summer. After living in Washington state for eight plus years, we have turned in our raincoats for winter parkas. As avid hikers and food lovers, we are thrilled to jump to the other coast to explore New England with our young daughter and sweet border collie mutt. When we first toured the property, it was obvious this home has been full of much love and cherished memories. We are certainly honored to follow in the Sterling’s footsteps running the cottage. We are two miles east of the Village of Woodstock Green. What an awesome weekend! Elizabeth had fresh cheese, butter, and eggs ready to go when we got there. She had amazing recommendations for food and places to go. Would highly recommend staying at the cottage!! We chose Sterling cottage due to its central location to the sites we wanted to see in VT and after viewing the photos and reviews online. It was such a warm, cozy and inviting cottage, we changed our plans and chose to visit around Woodstock (a lovely town) just get back to the cottage and hang out! The cottage is immaculate! Besides having all we needed in the cottage, Before we got there, Elizabeth had set us up with a few wonderful local goodies (she even set out water for our dog!) and after we got there she stopped by with home made cookies! We felt so special! We really felt at home. Loved our visit to Sterling Cottage. It was stocked with fresh coffee creamer, eggs, and cheese. We had a lovely time. We chose Sterling cottage based mostly on reviews and they did not disappoint. Elizabeth and Jason were very welcoming. The cottage is very cute and comfortable. The fridge and cabinets were well stocked. All the extras were greatly appreciated - milk, eggs. juice, cheese and crackers, fresh baked cookies and cookies for our dog. We were traveling with our dog Coco who had a wonderful time running up and down the hills. The property is beautiful. It's close to all the local attractions. Our travel dates were October 19 to the 21. We enjoyed two beautiful fall days and the third with a touch of winter (snow flakes). This property would be beautiful in any season. I would recommend this property for a couple and we would definitely go back. My husband and I have been going to Woodstock every fall for several years now. We usually stay in a local hotel but decided to give a VRBO a try this year. This is a great little cottage, it's cute and cozy and has everything you need to feel at home. Little washer/dry units should you need them, a warm gas fireplace and the main living area looks out onto a peaceful yard and woods further back. The location is fantastic, just outside downtown Woodstock. The hosts were very welcoming and left a much appreciated little sampling of local cheeses and fresh made cookies. I'm sure we'll stay here again.